WARNING!LICENSE SUSPENDED IN KANSAS UNTIL 12/7/2017! He is active again doing abortions at WWH in Peoria, 12/18. Former abortionist at: Hope Clinic for Women Former abortionist at: South Wind Women's Center (Wichita, KS) Former abortionist at: Planned Parenthood Comprehensive Health (Overland Park, KS) Former abortionist at: Whole Women's Health of Peoria (IL) Kansas Suspends Abortionist’s License for 90 Days for Violations During Abortion on 13-Year Old, 9/19/2017 Kansas Considers Discipline for Planned Parenthood Abortionist for Violations Related to Abortion on 13-Year Old, 8/11/2017 Allen Palmer has been conducting abortions at Planned Parenthood, WWH, and South Wind. 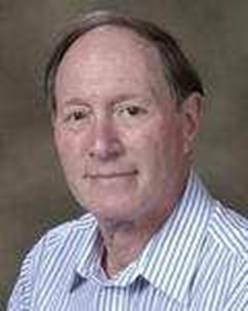 Allen S. Palmer, Missouri license verification and disciplinary history - Palmer was placed on probation for 5 years due to a felony conviction for Federal Income Tax evasion Former felon and abortionist Allen Palmer retires from butchering babies and women. Bridgeton abortion doctor retires, closes business Abortion Practitioner Allen Palmer of St. Louis, Missouri Retires Planned Parenthood Association of Kansas City, Inc. v. Ashcroft, July 8, 1981 - Planned Parenthood, Allen S. Palmer, and other plaintiffs sue the attorney general of Missouri over abortion regulations in Missouri. Abortion Center in Illinois Hit With Second Botched Abortion Lawsuit in Weeks Dr. Allen Palmer v. Jane Drummond, et al., Dec. 12, 2008 - Abortionist Allen Palmer sues over Missouri legislation regulating abortion clinics. Profile for medical license in Illinois. Paperwork for his physician's assistant at South Wind in Wichita, KS. KS license renewal shows Palmer working at Planned Parenthood in Overland Park, KS, seeing 25 patients per week during a 6 hour work week there. He worked at this PP abortion clinic an average of 15 weeks per year during 2012-2013. Palmer's Kansas Medical License Application. Indicates he was born in 1939. KS License renewal shows Palmer worked at Planned Parenthood in Overland Park doing about 30 abortions per week, 20 weeks per year during 2011-2012. 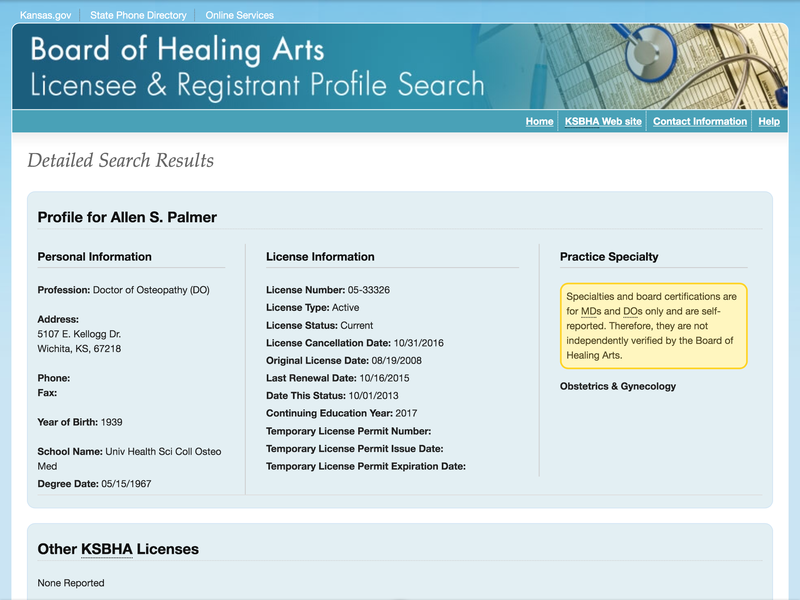 Kansas Board of Healing Arts 2012 Audit of Palmer's license to ensure compliance with continuing education requirements. KS license renewal shows Palmer estimating that he will work 4 hours per week and see 9 patients per week at this abortion clinic. He estimates he will work there 14 weeks per year during 2013-2014. 1992: Disciplined by Illinois due to a criminal conviction related to filing a false corporate tax return in Missouri. Sept. 9, 2017 -- Details on temporary suspension of Allen S. Palmer's Kansas medical license. September 14, 2017: The Kansas Board of Healing Arts suspends Palmer's Osteopathic Medicine License for a period of 90 days ending December 7, 2017. He failed to comply with Kansas law requiring him to submit fetal tissue samples to the Kansas Bureau of Investigation from abortions done on girls under 14. May 15, 2017, disciplinary petition filed by the Kansas Board of Healing Arts for failing to retain tissue from an abortion on a 13 year old girl and submit tissue to the KBI as required by law. The abortion took place in 2014 at Planned Parenthood in Overland Park, KS. 2008: KS Board of Healing Arts lists Palmer's lengthy history of out-of-state disciplinary action and a felony conviction, all grounds for denial of license. However, Ex. Dir. Larry Buening signs order during Sebelius Administration to license him in Kansas despite his horrific record. List of lawsuits in Missouri. Abortionists Allen S. Palmer and Martin J. Roitman plead guilty to tax evasion charges. Abortionists Allen S. Palmer and Martin J. Roitman are convicted of tax fraud for not reporting cash payments from clients. Both doctors are sentenced to six months in jail. Palmer is also fined $5,000 and required to perform 250 hours of community services. Article part 1 on protester at abortion clinic. Article part 2 on protester at abortion clinic. Article says Drs. Allen S. Palmer and Martin J. Roitman served 4 months in prison for tax evasion. They evaded more than $3 million in back taxes and penalties by not reporting cash receipts from their abortion clinic clients. Patient informed consent form - Allen S. Palmer, D.O., listed as an abortionist. Transcript of disciplinary hearing where Palmer admitted he did not check a 13-year old's medical record prior to conducting an abortion on her. Affidavit that Palmer submitted in his own defense in a disciplinary case that resulted in a 90 license suspension in Kansas. Palmer was initially listed as supervising physician for Physician's Assistant Ann Gates at Women's Health Clinic, aka South Wind Women's Center in Wichita, KS. His name was hastily scratched out and the name "Cheryl Chastine," a known South Wind abortionist, was written in. In this document, it shows Palmer answered "yes" to disciplinary questions (redacted from applications), he was convicted of felony tax evasion and sent to prison, he had a malpractice case against him, and he has been fined or put on probation in other states.